Home > News > Senior School News > You’re invited… back to the future! The Foundation for Young Australians (FYA)’s released a report series in 2018 called ‘The New Work Reality’. https://www.fya.org.au/report/the-new-work-reality/ The report examines what ‘work’ is going to look like in the future for young Australians and the difficulties they are expected to face with the increase in automation due to technology. This report directly supports the essence of The DeLorean Project at Glasshouse Christian College. We have identified a need to explicitly equip students with the necessary skills and capabilities to navigate their future in a rapidly changing society. In addressing this need, the DeLorean Project is an integrated program for all of our Year 10 students. One day a week for the entire year, the focus of the project is not on academic content, but rather, it offers students an opportunity to develop and demonstrate transferable skills and capabilities. Students are exposed to these skills through authentic experiences to practice and develop them. Skills such as communication, collaboration, critical and creative thinking, awareness of self and others (to name but a few) are explicitly taught and integrated in the program. How we do this is by encouraging students to find a passion, an area of interest or a real problem and then find a solution or a means to create something of value that can be shared with (potentially) the world. The program is led by seven facilitators (college teaching staff) who support the students in their real time learning experiences. Further to the wide range of knowledge and experience of the facilitators, we invite in social entrepreneurs and business people as guest speakers and mentors to ensure that the program remains relevant to industry and also to bridge the gap for students between our insulated little ‘education bubble’ and the real world. The program is now into its fourth year and supports approximately 25 startups/projects a year. A couple of startups last year offered professional photography and media services. Other startups have adopted the social justice/entreprise model and have sought to address the fast fashion crisis by creating beautiful hand-sewn bags out of recycled clothing, while another team made dog toys out of recycled denim (this team were in collaboration with the Sippy Downs Animal Refuge Centre). With the generous donation of a mobile coffee trailer by the GCC P&F committee, The Coffee Kids ran a successful venture and had many valuable and authentic learning experiences along the way. There are many more stories of success, and some that are still evolving as the students begin to realise their capacity to do something relevant and meaningful now, rather than wait for their future to start. This year’s cohort is chomping at the bit to get started on their creative ideas for their projects and we’ve got a few more paces to put them through in order to build their foundations and maximise the opportunity for long term success. We invite you to follow The Delorean Project on social media (@thedeloreanproj on both Facebook, Instagram and Twitter). You will be able to keep up to date with what’s happening in the program as we post regular interviews with facilitators, have students share their journey and their insights and learnings, and promote the successes of the challenges and outcomes from week to week. We have appreciated all of the support of our network in the past three years and are keen to see it grown and add further value for cohorts present and future. The DeLorean Project has proven to be a powerful program, enviable by educators and other schools around the country and the world and it’s awesome that we have the opportunity to set students up with skills that are relevant and real for today and whatever their future holds. We hope that you jump on board with us and enjoy the journey… back to the future! 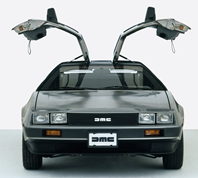 This entry was posted in Senior School News and tagged Back to the Future, Delorean Project on March 18, 2019 by sandy.